A belief in "the mock" goes hand in hand with its opposite: warding off disaster by purposefully imagining everything that could possibly go wrong, in the belief that by articulating the worst, one somehow prevents it from actually happening, perhaps on the grounds that catastrophe is, by definition, unexpected. Western Bulldogs supporters, like my mother-in-law, are expert at this, as previously discussed. On these grounds, I tipped against the Dogs two weeks in a row, and thus guaranteed that they actually won. But this week I threw caution to the wind and tipped them and they won anyway. WE CAN WIN THIS THING!!! According to my trusty Aboriginal calendar, True Spring is upon us, and will last until the beginning of November. "Warm, wet, windy" -- well, the windy part is certainly true, and there have been moments of warmth lately, albeit interspersed with icy blasts. For some reason, the playground of Alice's primary school is the coldest, windiest place on Earth, especially as you're counting down the minutes till the bell goes. Anyway, here's hoping for a bit more rain to go along with the winds. The Grade 2s and 3s have gone off on an excursion today. They were feral this morning, racing around shrieking. I'm glad I don't have to sit with them for two hours on a bus. There is excitement in the air at school, as our stimulation package finally gets underway. A nice big hole has been levelled in the ground where the new building's going to be, and soon the foundations will be poured. Next year Alice will have a beautiful new library and flexible classrooms to enjoy, instead of the shabby old asbestos-ridden shed that currently comprises the "Senior School," and the library shoe-horned into an upstairs classroom. I think the old shed was there when my mum was at the school in the 40s. By the end of True Spring, Evie will be starting Prep Orientation; my baby will be a grown up school girl. I'm both glad and sorry; but you can't have spring sunshine without the winds and rain. I am writing. No, honestly, I am! My current work-in-progress is evolving in a new way; I've never approached a book like this before. Generally the jumping-off point for a new novel for me is a scene or an image, like a scene in a silent film. For Singer, it was an image of a girl gazing over a snowy landscape, seeing an unconscious stranger carried to the tower on which she stood; for Taste Of Lightning, it was a herd of white horses flowing over a hill. Gradually I begin to see the figures in the landscape more clearly, their situation evolves, my characters come into focus and take on their own life, and the story accretes around them, like a pearl forming around a morsel of grit (well, hopefully it's a pearl). Often the piece of grit (that initial image) doesn't survive the writing process, but it's the foundation for all that follows. This time it's different. Because I started out wanting to write about a particular time and place (PNG in the 1970s), I didn't begin with any characters, or a clear situation. I've accumulated lots of characters now (exiled schoolgirl Julie, dashing young pilot Doug, hard-bitten housewife Barb, haus meri Koki, explorer's son Simon), but they're just milling around, staring at me mutely, waiting for directions. I have to find something for them to do. It's complicated, too, by the fact that my own memories keep getting in the way. It's hard to push my personal history aside, to remember that this story is not about me or my family, that this is fiction, that I have to imagine my way in, just as I would with any other story, not fall back on reminiscence. I'm not Julie, and my sister is not Nadine; Allan and Barbara are definitely not my parents. So I've been writing my way in: fragments of scenes where two characters interact, talk to each other, go to a party, argue, swap books. I never know what's going to happen when I put them in a room together. Julie and the mission wife next door unexpectedly began to play Monopoly; Julie's mother cast lustful looks in a surprising direction; Julie's sister Nadine turns out to be a compulsive fibber. This is all very interesting (for me), but it isn't yet a story. Then yesterday the scene that I've unconsciously been waiting for dropped into my mind -- the spark to ignite the narrative, the push to start the story rolling. Once I'd seen it, it seemed so obvious: of course, that's what happened! This is how X and Y and Z first met, this is what binds them, this is the source of the tension between them, this is their shared secret. The mists lift and there is the solution, plain and simple and true. Everything else flows from this; the shape of the story begins dimly to reveal itself, like a mountain range lifting out of the clouds. Which is a very appropriate metaphor in this instance, as anyone familiar with the Highlands will recognise. Now I just have to write the damn thing. "You need to be strong to be a Bullies supporter," my mother-in-law says, and she should know; she's been a staunch Western Bulldog all her life. Family legend has it that her mother washed the team's jumpers after Footscray's one and only premiership in 1954*. Joy has learned to live with dashed hopes, promising starts that fizzle into nothing, years of being the poorest, most struggling club in the league, years of being just not good enough. Her instinct is to assume the worst. Michael refuses to sit next to her at games because of her persistent, superstitious negativity. We might be fifty points up at three quarter time, but "You never know..." Joy shakes her head dolefully and refuses to celebrate until the final siren. Even then, it's not so much elation as relief. When Rodney Eade took over as coach, he commented on the side's lack of confidence. It's an attitude the supporters share. Even when we're doing well, we can't quite believe it. We've seen the wheels fall off too many times. No one hates the Bulldogs, because we've never been a threat. At work, Michael sits near a Collingwood supporter. She says, "I always tip the Magpies, and I always think they're going to win." Michael says, "I always tip the Bulldogs, and I always think they're going to lose." So we'll be watching the game against the Cats on telly tomorrow night, resisting the temptation to switch on the radio and find out what's happening in real time, and we'll fight the usual battle between excruciating hope and the familiar comfy slippers of despair. * though actually, it turns out this story isn't true. But why spoil a family legend?? And yes, that's right, 1954. There's an entire generation of Doggies supporters who have never seen their team bring home the big one. NEVER. I wonder if indoctrinating Alice and Evie into the Dogs is a form of child abuse? This is just the coolest thing I've ever seen in my life. 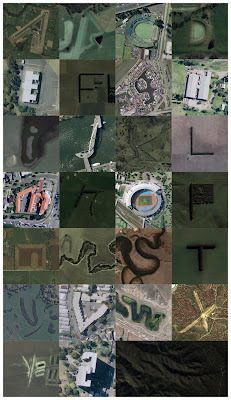 An artist called Rhett Dashwood has created an alphabet from images culled from Google Earth. I think all the locations are from Victoria. O looks like the MCG when the Commonwealth Games were on, and J is the pedestrian footbridge across the Yarra. Okay, so I mixed up James Freud's rock'n'roll memoir I Am The Voice Left From Drinking with Mark Seymour's Thirteen Tonne Theory, which is the one I heard on the radio. No offence to James, but Mark Seymour's is much more literary. Not to say that James Freud's story isn't interesting -- it's fascinating, in a train-wreck kind of way, and it's reminding me of the heady days of the eighties and nineties when I was working in the "industry." Lots of money splashed around, booze, lots of drugs (not that I had anything to do with that, I was much too prim), lots of silly mayhem and really, really stupid hair. And it turns out, Out Of Mind, Out Of Sight, which I associated with high school, wasn't released until the year after I left. Whoops. It must have been I Hear Motion that we danced to in the quad. I'm sure I read reviews a little while ago (within the last couple of years?) of a book about a girl who could pick up clairvoyant images from objects she touched -- see their past owners etc. For ages I thought it was I, Coriander but then I read I, Coriander and realised it wasn't. Was I hallucinating? Does anyone know the book I'm thinking of? PS You know how I was wondering (below) if Nancy Drew was as good as I remembered? Well, it isn't. It's crap. Because we love the Little Princess, and Evie is phobic about doctors and hospitals after her traumatic splinter extraction last summer which ended with blood splattered on the surgery walls (long story). ... who also wants to run her own lion park. Which I will read to her. Goody. Which I hope she will read to herself. A Solo book, which are fantastic for struggling readers because they're chapter books, but very short and simple. Unlikely stories which Penni thought might appeal to Al, after the success of Tales From Outer Suburbia, which she adores. I'm pretty doubtful that I'll actually read this, to be honest, but I felt it was something I ought to have. It's the updated version, too. Maybe the girls will use it for a school project, or a uni essay. If they still write essays by then. If the girls ever go to uni. I heard some of this read on Radio National, and it was fascinating, and well-written, even though rock'n'roll memoirs usually leave me pretty cold. Also the Models were the soundtrack of my high school years. Out of mind, out of sight, gotta keep my body TIGHT! Penni thrust all these on me and said I ought to read them. Which is true. So I will. Because it's about magic lessons, and it has a nice cover. Another one I might read aloud to the girls. Though I must say now I've noticed the missing apostrophe in the title, I have gone off it slightly. Not an ex-library book, this was published in the year I was born. It's about the relationship between two very different step-sisters and a secret room. Is Nancy as good as I remember? I suspect not. Another unread Australian classic. As a struggling would-be writer, I was always cheered by the fact that Elizabeth Jolley didn't get published until she was ancient. Now I look this up and find she was in her fifties. Gulp. Not that far away after all. Alice can't fall asleep. She is still wide awake at ten o'clock, looking at books, drawing, making light shows on the ceiling with her torch, listening to stories, sometimes brooding (no story to listen to = increased likelihood of brooding). Often she calls out to Michael and me in the living-room, "What are you talking about? Talk louder!" Evie, on the other hand, conks out as soon as her head hits the pillow. But she is an early riser, frequently waking at 5.30, bright as a button and ready to start the day. Worse, she often wakes in the night and crawls into our bed, which means disrupted sleep for all three of us. If they were both owls or both larks, I think we could handle it better; but having one or other of them awake seemingly permanently is very wearing, and incidentally does little for parental privacy! Apparently it takes 21 days (or nights) to form a new habit. The clock starts now. Yes, my boys beat them at the weekend (and so they should have, in fact we should have buried them, but didn't, which is slightly worrying as September draws nearer... but anyway...) which has led me to reflect on poor old Fremantle's general awfulness. I'm not bagging the players (in fact some of them are pretty bloody good, hello Matt Pavlich if you're reading, and Aaron Sandilands, gee you're big), or the coach, or anyone associated with the club actually, with the possible exception of the marketing department who helped set them up in the first place. First, the jumper. It's horrible. What a mishmash. Everybody knows that footy jumpers should have no more than three colours. Freo has four: white, green, red and purple. I only discovered after research today that the green and red are supposed to represent port and starboard, thus emphasising the maritime theme. Well it ain't working. No one knows about port and starboard. You need to lose at least one of those colours. It probably won't be purple, as that's the most distinctive hue. Maybe a white, green and purple jumper is the way to go? (Traditional suffragist colours, by the way, if anyone's interested. The Freo Feminists? Hm... probably not.) In STRIPES. Or with a SASH. Or a V. Like a real jumper. And what's with the anchor? It's just ugly. Drop the anchor. We’re the mighty Freo Dockers! Etcetera. I won't inflict the whole thing on you, it's too painful. You can listen to it here if you're a total masochist. Compare that abomination to Richmond's joyous "Tigerland... Yellow and black!" or the sublime Sydney song, where they "shake down the thunder from the sky." Again, I discovered today that the awful dirge upon which Freo's "rock'n'roll" "anthem" is based is the traditional awful Russian dirge, The Song of the Volga Boatmen. So again, you have to give them points for trying to work to a theme. But it's just horrible. No wonder they never win, who'd want to stand around and sing that after a game? You couldn't belt that out, it's unbeltable. In short, the reason Fremantle have been so unsuccessful is that they have nothing to play for. A jumper no one could be proud of, a ridiculous nickname they're not even officially allowed to use, and a club song that no one could enjoy singing. My prescription: a new jumper. Perhaps green, white and purple hoops. Something clean and sensible. A new nickname. There must be some animals left, surely. Could they be Goannas? They're pretty scary. Or Emus? Okay, I'm clutching at straws here. I guess they're not going to want to be quokkas. As long as it's not one of those abstract noun names -- Power, Victory, Storm. Ooh, I know, if they want something wind-related they could be the Hurricanes. As long as they don't try to draw it on the jumper. A new song. Preferably something, you know, singable. How hard can that be? Base it on a song everybody knows, that's out of copyright. Don't try and write something new. That way madness lies. And then start winning some games. Easy.